In the second measure of the first voice, the 8th notes are tied together in pairs. Why would it be notated this way instead of as fourth-notes? Besides the answers above, which are correct, this can also happen in non-lyrical music. You might choose not to write a note in the largest fraction(s) available if you want to use the smaller fractions to show the underlying rhythmic structure or to make it more obvious where two staves align. 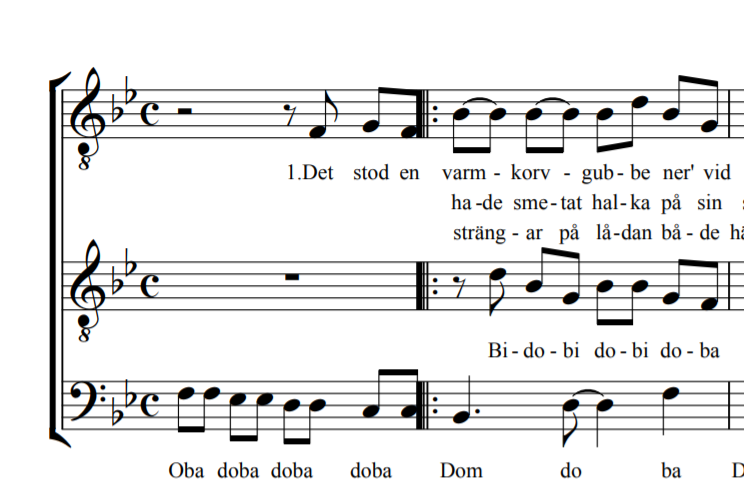 In this song, for example, looking at the top two staves especially, the basic block looks like eighth notes mostly grouped in pairs. This allows you to change your frame slightly when describing how the voices align. You can actually see this in the third staff. The first note is a dotted quarter. Why, then, is the second note an eighth tied to a quarter; why not make it a dotted quarter too? There's only one syllable in all verses. The answer is that it helps to keep the alignment of the basic blocks together. If we had two dotted quarters, it'd almost suggest the basic unit was in threes like a waltz. But by using a tied eighth, we complete the pair from the first dotted quarter and the quarter note then lines up with the next pair. P.S. This recent answer also perfectly highlights using subdivided notes to show the beats in a measure! If all the verses had exactly the same number of syllables, there would be no need. 'Varm' and 'korv' are both one syllable, so need a crotchet each, shown by tied quavers. But in verse 2, 'ha-de sme-tat' uses 4 syllables, which need to be shown on the dots with 4 quavers. The music is trying to show how each word in each verse is sung, and because they're all slightly different, this is the only way. Because the lyrics of some (but not all) stanzas require breaking the quarter note into two eighth notes. It's sort of a tossup what to play when playing this purely instrumentally. If you are playing this three times (sort of as a sing-along) it makes some sense to follow the metre of the individual stanzas. Otherwise I'd likely play the quarters. How to notate two identical notes ringing together? why is some sheet music written 1 octave lower?